Hank Williams Jr. performed an acoustic benefit concert at the Country Music Hall of Fame and Museum on Dec. 6, marking the close of a four-year run of Family Tradition: The Williams Family Legacy exhibit. 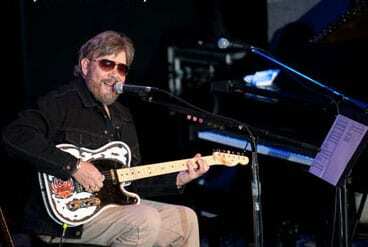 Hank Jr.’s performance infused personal memories and raised $75,000 to benefit the Hall. He also announced that many artifacts he loaned for the exhibition will stay in the museum and archives. The 90-minute show included Williams’ own hits, youngest son Sam singing “The Blues Man,” new tunes from a forthcoming CD, and classics from Hank Williams, Johnny Cash and Waylon Jennings. Special guests in the audience included Jessi Colter, Shooter Jennings, Jamey Johnson, Williams’ wife Mary Jane, and children. After the concert, Williams greeted audience members and posed for pictures in the Ford Theater. A reception followed in the Hall of Fame Rotunda, and fans received a signed poster commemorating the exhibit. Family Tradition opened on March 28, 2008. Originally scheduled to close on Dec. 31, 2009, the exhibit became the most popular and acclaimed exhibition in the museum’s history and was eventually extended through Dec. 31, 2011.